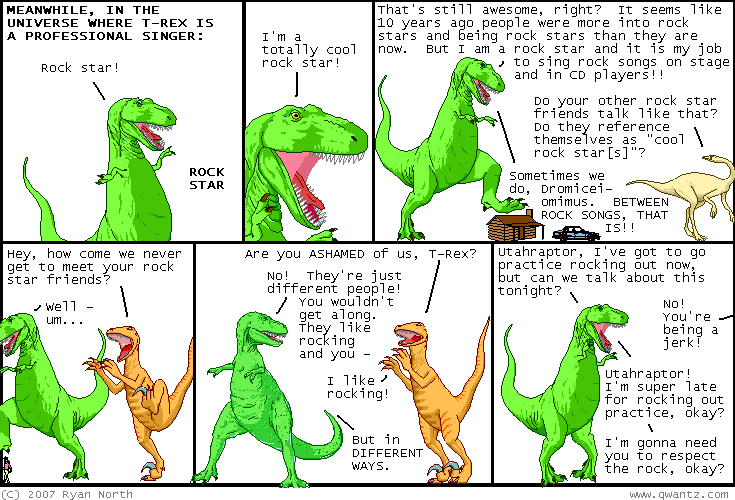 Dinosaur Comics - June 7th, 2007 - awesome fun times! June 7th, 2007: Hey dudes and ladies! Me and some Dayfree peeps are at the Toronto Paradise Comics show this weekend! It starts today and has lots of comic stuff. I'll be there with my books and shirts AND I'll also be selling Rich "Diesel Sweeties" Steven's shirts too, so it is like TWO WEBCOMICS IN ONE! In a sense. You should come!